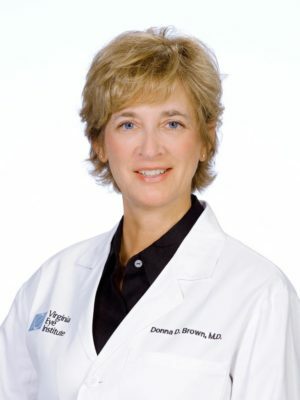 Donna D. Brown, M.D., F.A.C.S. is board certified by the American Board of Ophthalmology and specializes in cornea and external disease and pediatric ophthalmology and adult strabismus. Dr. Brown received her Doctorate of Medicine at East Tennessee State University. She completed her residency in ophthalmology at the University of Texas Southwestern Medical Schools Affiliated Hospitals followed by fellowships in cornea and external disease and in pediatric ophthalmology and adult strabismus. A native of Tennessee, Dr. Brown completed her undergraduate studies at Carson-Newman College. She is a Fellow of the American Academy of Ophthalmology, a Fellow of the American College of Surgeons, a member of the American Association for Pediatric Ophthalmology and Adult Strabismus, as well as a member of the Cornea Society. She also serves as the Medical Director for the Old Dominion Eye Foundation, the organ procurement organization for corneal transplantation and eyebanking.